Items per quantity: Pack of 100 labels. Caution 230 volts symbol and text safety label. Ansi style safety labels. Electrical hazard. Warning. 230 Volts. Contact may cause electrical shock and injury. Disconnect power before servicing. Self adhesive vinyl with clear protective laminate. Supplied in packs of 100 labels. Available in 2 sizes. Waterproof, chemical (oil and solvent) and abrasion resistant. 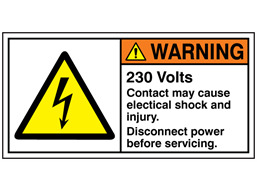 ANSI safety labels for electrical hazards. Warning, 230 Volts, contact may cause electrical shock and injury, disconnect power before servicing. Supplied in packs of 100 labels. Abrasion, rub and chemical resistant. Waterproof. ANSI0081 Size 25mm x 50mm (nominal 1 inch x 2 inch). Material self adhesive vinyl, with clear protective laminate. ANSI0082 Size 50mm x 100mm (nominal 2 inch x 4 inch). Material self adhesive vinyl, with clear protective laminate.